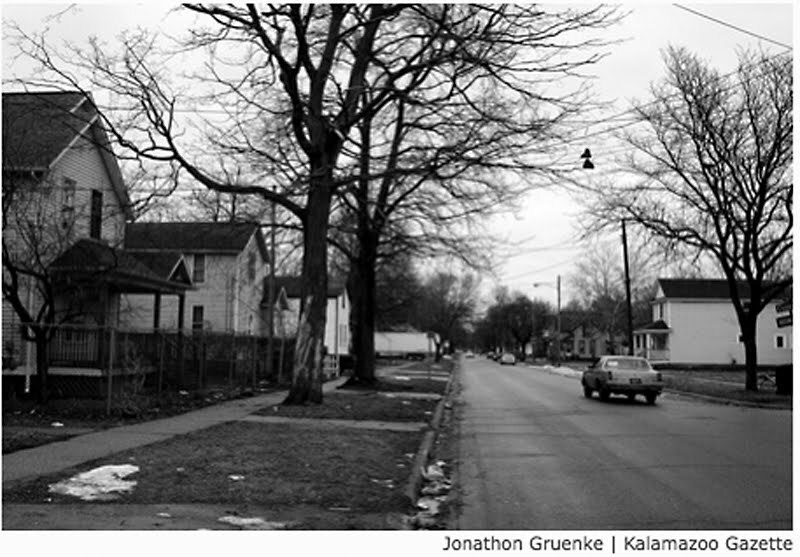 Every once in a while I think back to the Washington Square neighborhood in Kalamazoo when I was a small boy. I remember a quiet peaceful place. 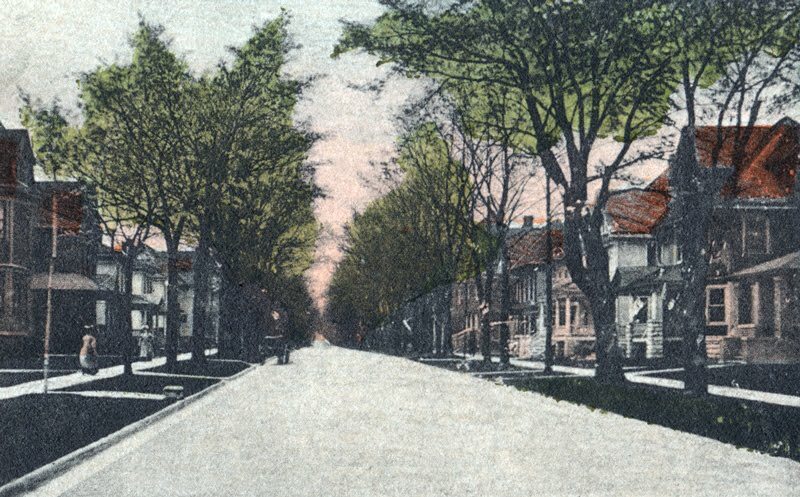 A tree lined street with good sized homes built just before the turn of the 20th century. 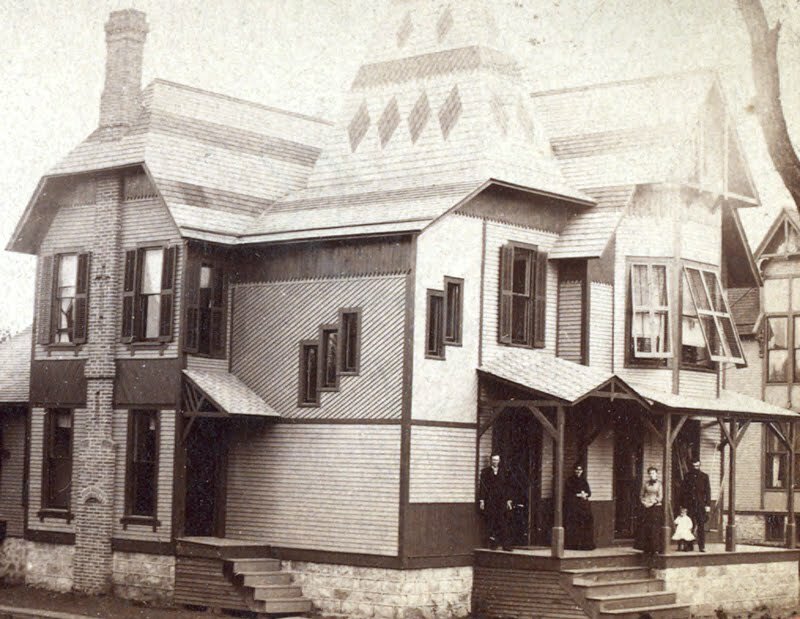 At the time, Kalamazoo was at the peak of its growth. Then...I remember the screeching tires of a speeding car that should have killed me. I had darted out into the street on my bike right in front the car. He must have been doing 40 MPH on a residential street. I was following right behind Danny Paddock who was also riding his bike. The car stopped within inches of me. I remember the gleam of the chromed bumper and the reflection of my expressionless face. Maybe that was a omen for things to come for the Washington Square neighborhood. I can still hear those screeching tires and smell of burnt rubber. Danny was later killed along with his father in a trucking accident when his older brother fell asleep at the wheel of their semi-truck. Yes, my neighborhood had a few truckers. Academy Street...my street still looked like this in 1970’s...this photo is from the early 1900’s. 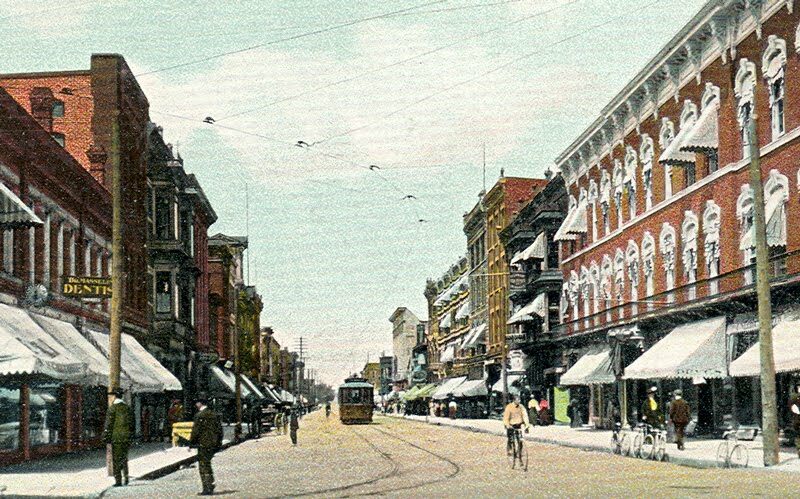 Burdick Street...early 1900’s...notice the electric street car! What happened to all the street cars? 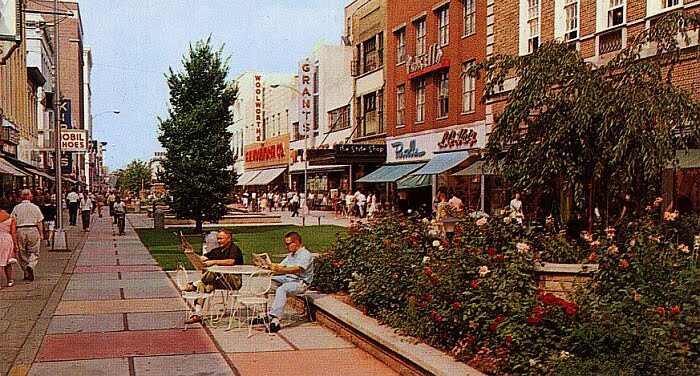 Kalamazoo prided itself, among other things, on creating the first open air mall in America by closing off the store lined street. 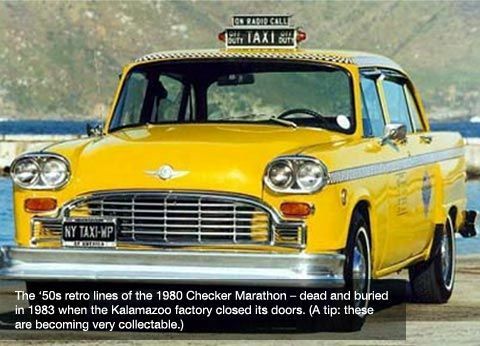 ...for some, Checker cabs enabled a way of life...the last Marathon Checker rolled off the lines July of 1982. 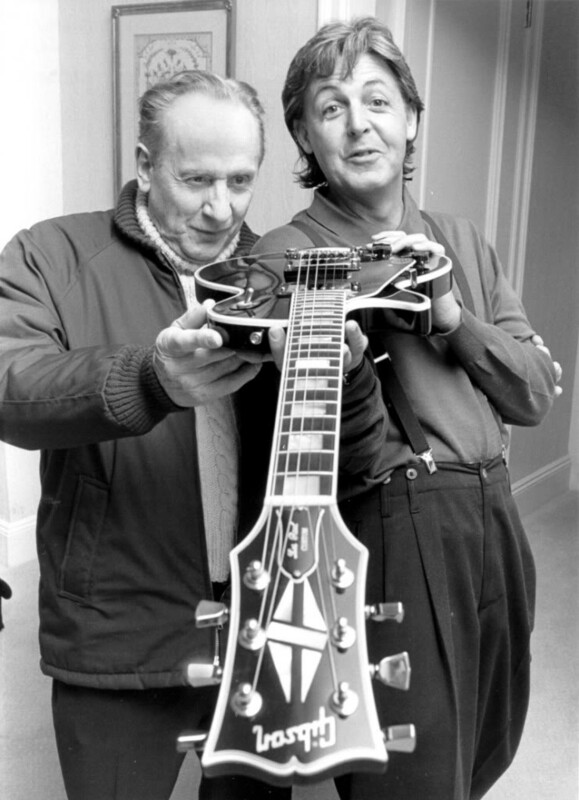 Les Paul and Sir Paul admiring the Gibson Les Paul Guitar...Gibson Guitars started crafting guitars in Kalamazoo back in the late 1800’s. 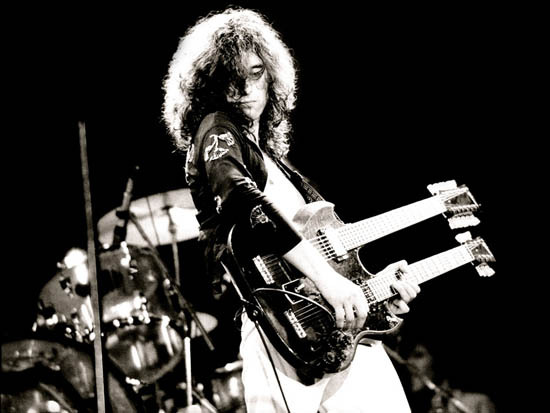 Jimmy Page of Led Zeppelin with Gibson’s double necked SG (EDS-1275), “the coolest guitar in rock”...do you know Stairway to Heaven?...Jimmy used this to play live without the cumbersome switching of guitars midway through Led Zeppelin’s signature song...that’s innovation! 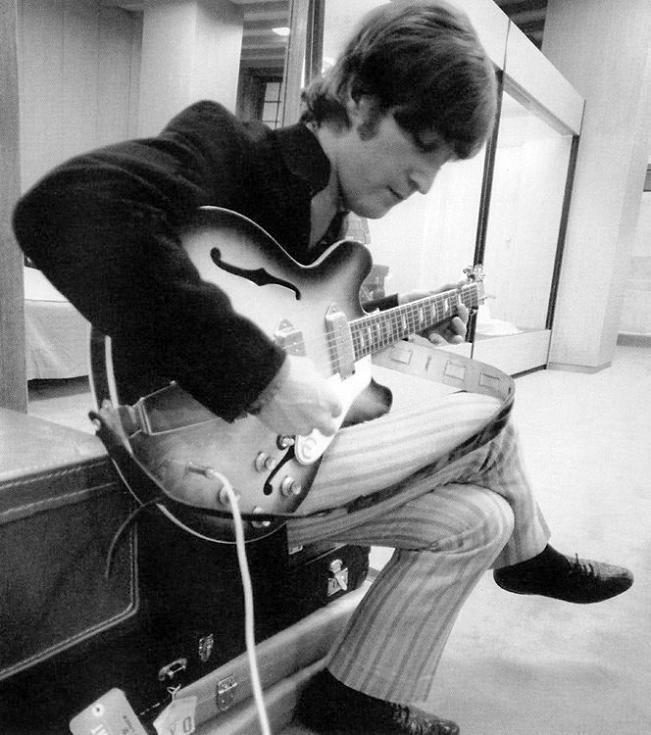 John Lennon and his Epiphone Casino...Epiphone guitars were also made in Kalamazoo. However, Gibson, the parent company, moved the production of Epiphone to Motsumoko of Japan in the early 1970s. The list of notable artists playing Gibson Guitars is staggering...and the list of Epiphone playing artists is also a bit of fun trivia. The old craftsmen banded together to create Heritage Guitars. Heritage makes great guitars, but most people don’t know who they are. Heritage is no match for the marketing machine and iconic brand name of Gibson. In February 2009, a group of teenagers on Frank Street beat a 49 year old man unconscious because he rode his bike into the wrong neighborhood...pictured here. Yes, those are tennis shoes hanging from the power lines...that means you can buy drugs near by...nice. 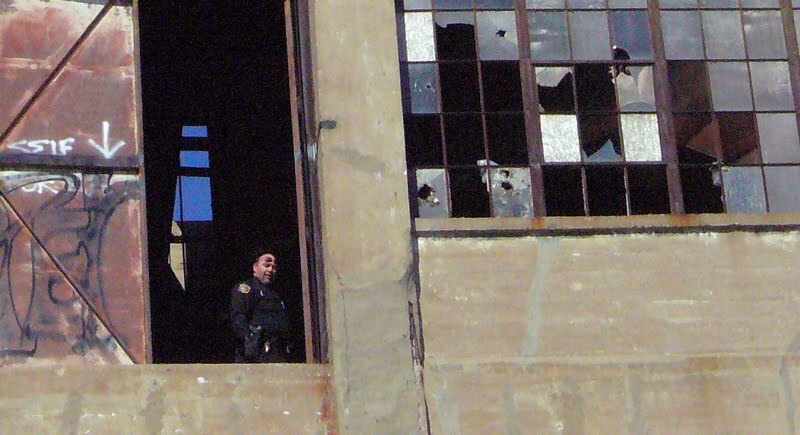 October 29, 2009, a deadly shooting in my old neighborhood...I am sure it was not the first. Of course, it doesn’t help that in October of this year, Michigan has 14% unemployment...and no one can sell their homes. 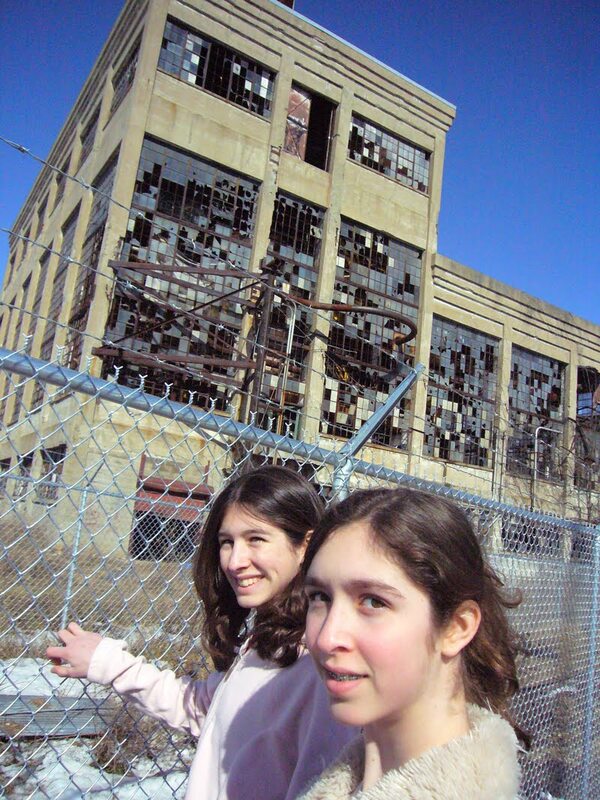 A couple of years ago, I was showing my kids an abandoned paper mill (we exploring...). I told them how Kalamazoo used to be one of the largest paper manufactures in the country. I didn’t mention that I thought the land is part of the government’s Superfund and we were likely standing above tons of buried toxic waste. 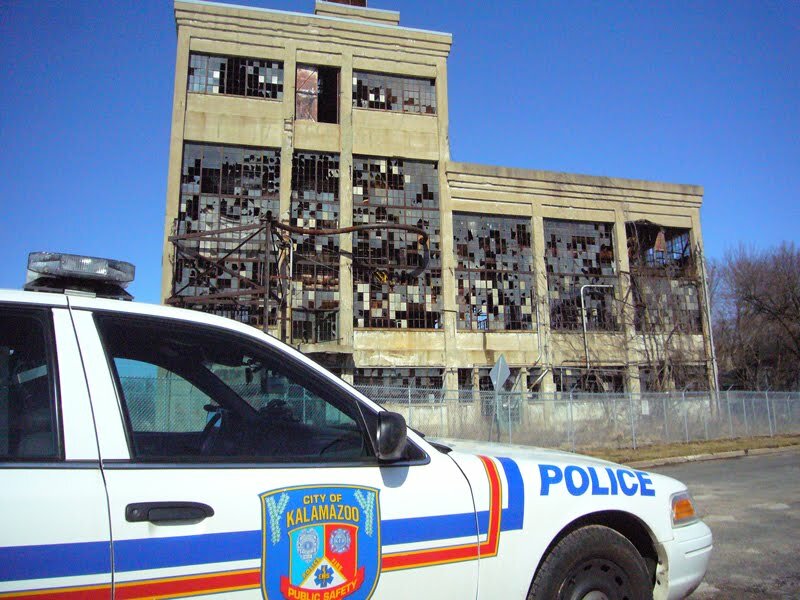 Clearly, we were not drug pushers, but they checked the building anyway. Someday, we can design a more sustainable community, maybe things will be better...until then, I can hope. Yesterday, I was privileged to meet a talented French conductor, Paul Meyer. In addition to his conducting, Paul happens to be one of the world’s foremost clarinetists. 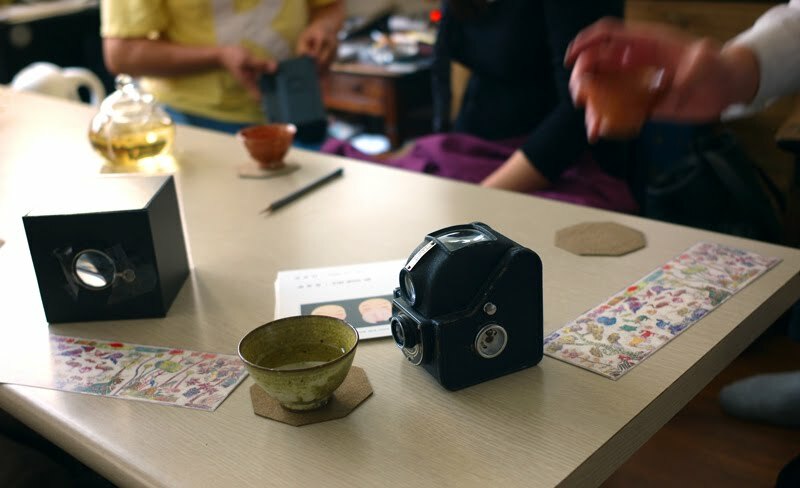 Originally, I was supposed to have coffee with Mr. Lee at our usual hang out by the “pond,” but he changed plans at the last minute and invited me to an acquaintance’s photographic studio. By the way, Mr. Lee is was of the best net workers I have ever met. 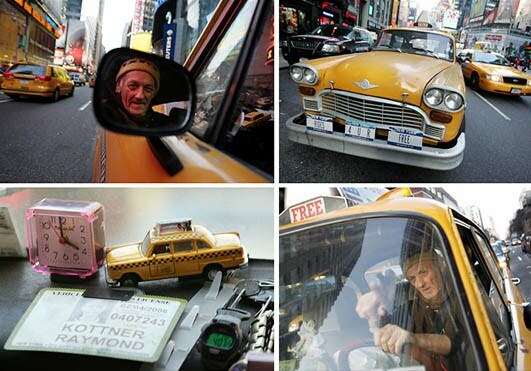 He is a brilliant man full of positive energy and always enjoys meeting new people. He has a knack for attracting all sorts of talented artists, intellectuals, business people, and otherwise interesting characters. What was so nice about yesterday, was that there was no mention as to who would be at the studio. I just sat down for tea. We came to know each other through serendipity. 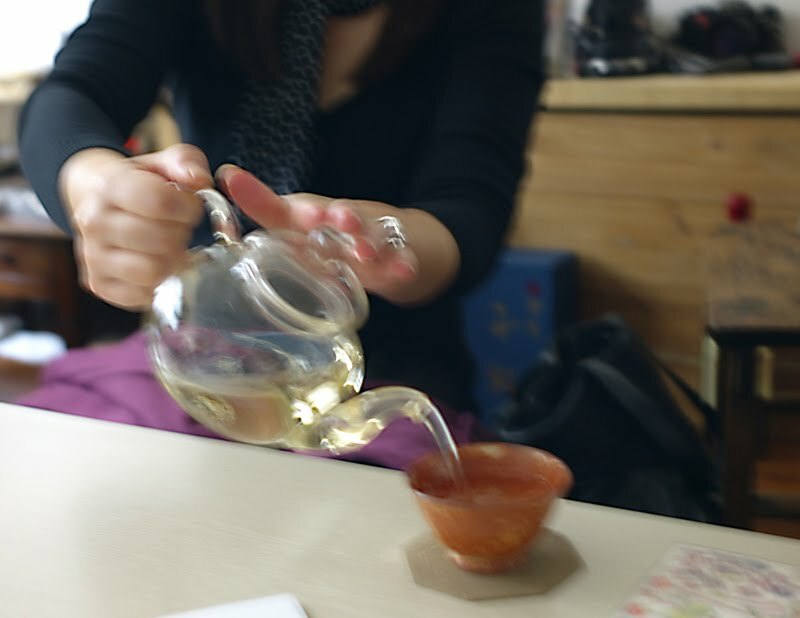 No, not bag tea...real tea...loose green leaves...hand picked, toasted, and rolled from the South of the Korean Peninsula. At the studio, was my friend Mr. Lee, photographer Mr. Hong, artist Jino Park, gallery owner Soojin Song and Paul Meyer. It just so happened, that Paul was in Seoul to conduct the Seoul Philharmonic Orchestra. Quite an honor, but he is deserving while being humble. A trait that resonates with Korean culture. He was stopping by Mr. Lee’s restaurant to visit and that got the ball rolling...then everyone ended up at the studio drinking tea. As I have mentioned before...everyone that you come into contact with, has a purpose for being in your life...I’ll let you decide for yourself why I ended up in the studio...what beautiful music! Being, that there those among us with such extraordinary talent... In recent times, people have lived vicariously through those extraordinarily talented people via Radio, TV, the Internet... However, I believe, those extraordinary people should be an inspiration as to what we all can aspire to. For expression is what makes us human; it is not only an talent, but a need. One day, she told me everyone used to sing and/or be able to play a musical instrument. She said she even used to go to three different churches (Presbyterian, Methodist, and Episcopal) every Sunday just so she could sing as much as possible. Later in life...to the dismay of her mother...she used to hang with the “band.” Not as a groupie, but as part of its circle of influence. She wasn’t sitting in her room listening to a box because there was no box to listen to. Nowadays, the more we listen/watch that box...the less time for us to develop our own self expression and talents. I suppose, now, everyone can play iTunes. This may be a good thing because I have noticed...and now believe...iTunes and the Internet has sparked a new generation with a vigorous interest in participation. ie Garage Band, Guitar Hero, Retail shops like Guitar Center, etc. Just check out all the amateurs on YouTube...I am hoping these are signs that the world is returning to the participation in “life” that my grandmother experienced. Maybe I can embed that concept in my children...whether it is through art, dance, writing, speaking or sports. Maybe they can pass it on... Live life and celebrate talent, but don’t let others do live for you. It was here, about a month ago, at the Kimusa Exhibition opening, that I saw Emil for the last time. Emil held his last exhibit here. The opening was kind of a reunion for friends who laid Emil to rest. We didn’t mention him much...but I could tell he was on all of our minds. Just seeing each other was reminder enough. They are Italian Architect friends of Emil and now mine... Marco and Simone gutted and painted an entire military office building pink. 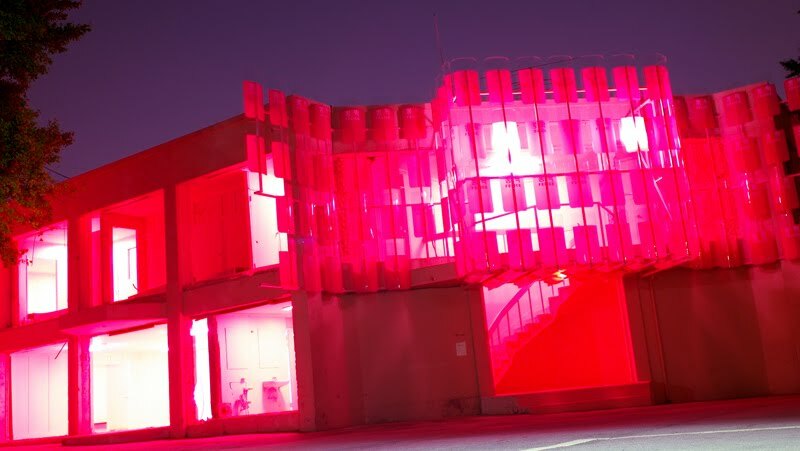 They ended up demolishing major portions of it to allow the pinkness and music to ooze out and onto the surrounding public space. 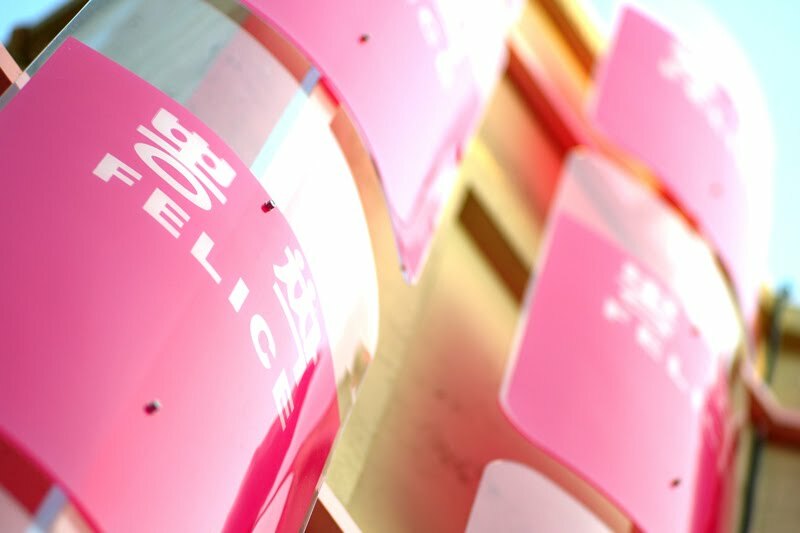 Marco and Simone had their team weld custom police shields to the facade with the words 뽕짝 (bong jak) and Felice silk screened on them. Bong jak is Korean for a traditional “polka” dance and Felice is Italian for happy. They added music and pink florescent lights for even more pinkness and mood. The building is a caricature...a pink...happy...dancing...police station...dance hall. Airan...whom I have not met...put together a multi-media, multi-dimensional exhibit that caught my attention. 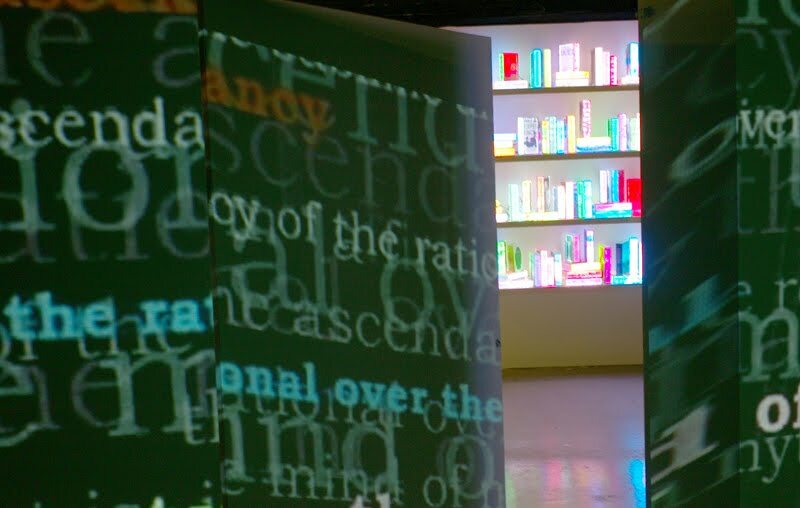 He created glowing books with embedded RFID so that when you bring a book into the “Reading Room” its contents are projected onto all the walls and accompanied by audio that sounds like the artist’s voice. There were several books shelves with almost 100 different books. 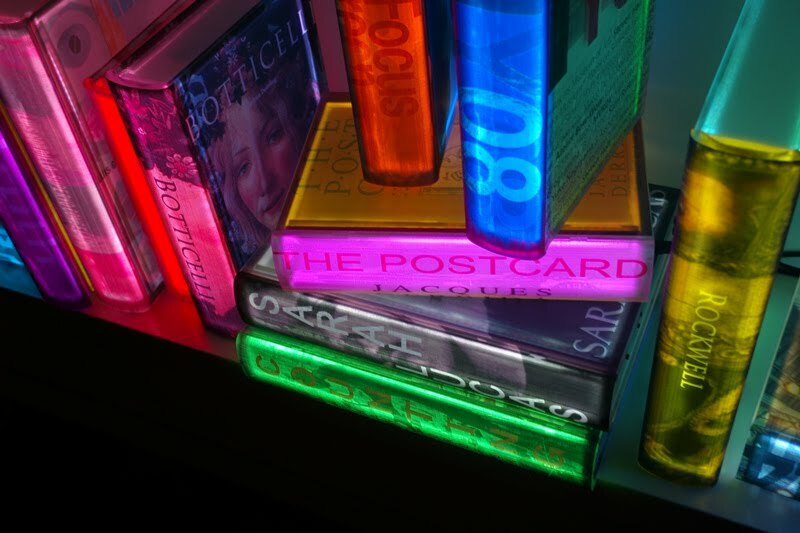 The room was glowing with books. 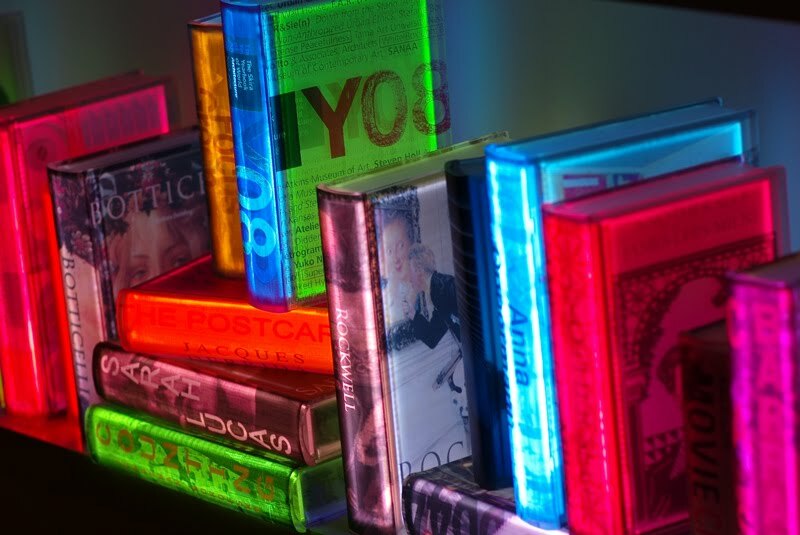 The books cycled through several different colors each trying to draw your attention. Once you find a book that interests you, just bring it into the “Reading Room” for an engaging audio and typographic experience. Well, the exhibition is huge. You can spend hours upon hours soaking up all sorts of creativity. I can just give you a peek at two.